With a subtle and sophisticated dot pattern, The Camrose Dot Tuxedo Shirt is ideal for formal weddings or parties where just a bit of flair is appropriate. The fabric is woven on a jacquard loom to create the dots, giving this tuxedo shirt a bit of texture. This shirt features a completely covered placket for a sleek ensemble. 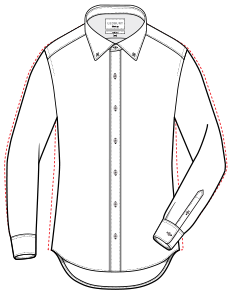 Finished with a Sartorial Mid-Spread Collar and rounded French cuffs. Tailored fit features a darted back for a more tailored fit around the torso.